Case 1: A 61-year-old hypertensive male with glued intraocular lens (IOL) implantation 2 years ago presented with decreased vision in his right eye. Ozurdex implant was injected intravitreally a week ago for refractory macular edema. On examination, the right eye had well-centered glued IOL with corneal edema [Table 1], iris defect at 10 o'clock, and migrated Ozurdex implant [Figure 1] in the anterior chamber (AC). Case 2: A 57-year-old diabetic male with glued IOL implantation with Ozurdex injection for diabetic macular edema [Figure 2]a and [Figure 2]b 3 weeks ago presented with decreased vision in his right eye. On examination, there was implant migration into the AC [Figure 3]a and [Figure 3]b with centered glued IOL. Under peribulbar anesthesia using the viscoelastic device the implant was made to align perpendicular to the long axis of the incision and explanted with viscoexpression [Figure 3]a and [Figure 3]b by counter pressure on the posterior lip. Case 2 required pre Descemet's endothelial keratoplasty (PDEK) for corneal decompensation [Figure 3]c, [Figure 3]d, [Figure 3]e, [Figure 3]f after a month. Ozurdex migration into the AC was initially reported with iris-fixated IOL requiring corneal transplantation., Owing to the proximity to the uvea, the sulcus, AC IOL, or iris fixated IOLs may require steroid implants to control inflammation., However, the inflammatory response is less with glued IOL. Both cases in our report had corneal edema, whereas case 2 required PDEK. The proximity to the endothelium and the greater rigidity of the implant soon after injection may be the probable risk factors for corneal edema. Deficient capsules, iridectomy, zonular dialysis, and prior vitrectomy are known threats for implant migration. Our report showed that even a well-centered glued IOL may not prevent this migration, and hence, the need for meticulous follow-up should be emphasized. Pardo-López D, Francés-Muñoz E, Gallego-Pinazo R, Díaz-Llopis M. Anterior chamber migration of dexamethasone intravitreal implant (Ozurdex ®). Graefes Arch Clin Exp Ophthalmol 2012;250:1703-4. Rahimy E, Khurana RN. Anterior segment migration of dexamethasone implant: Risk factors, complications, and management. Curr Opin Ophthalmol 2017;28:246-51. 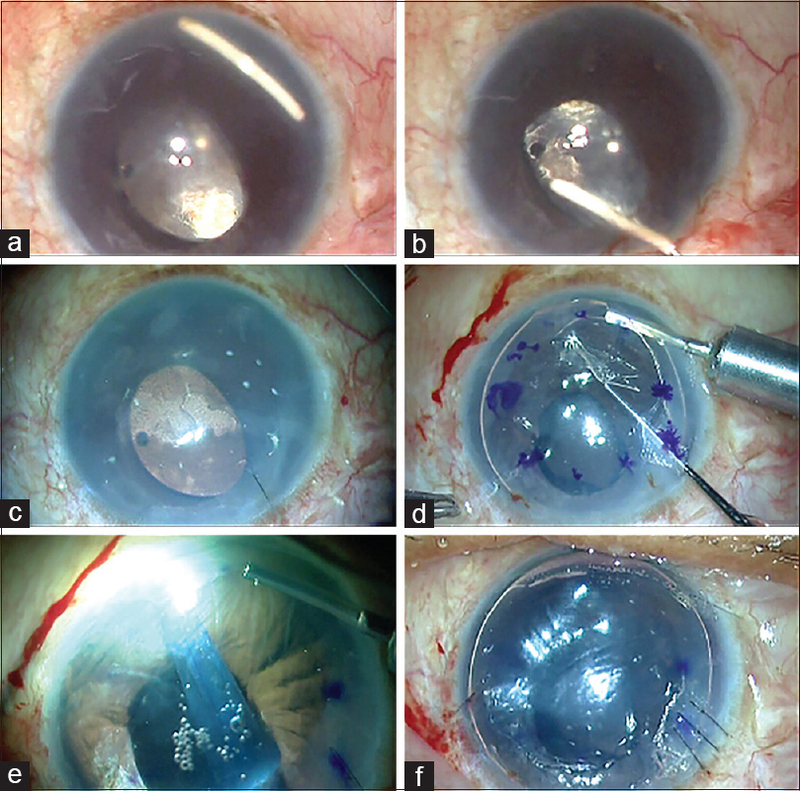 Amino K, Yamakawa R. Long-term results of out-of-the-bag intraocular lens implantation. J Cataract Refract Surg 2000;26:266-70. Evereklioglu C, Er H, Bekir NA, Borazan M, Zorlu F. Comparison of secondary implantation of flexible open-loop anterior chamber and scleral-fixated posterior chamber intraocular lenses. J Cataract Refract Surg 2003;29:301-8. Kumar DA, Agarwal A, Packialakshmi S, Agarwal A. In vivo analysis of glued intraocular lens position with ultrasound biomicroscopy. J Cataract Refract Surg 2013;39:1017-22.